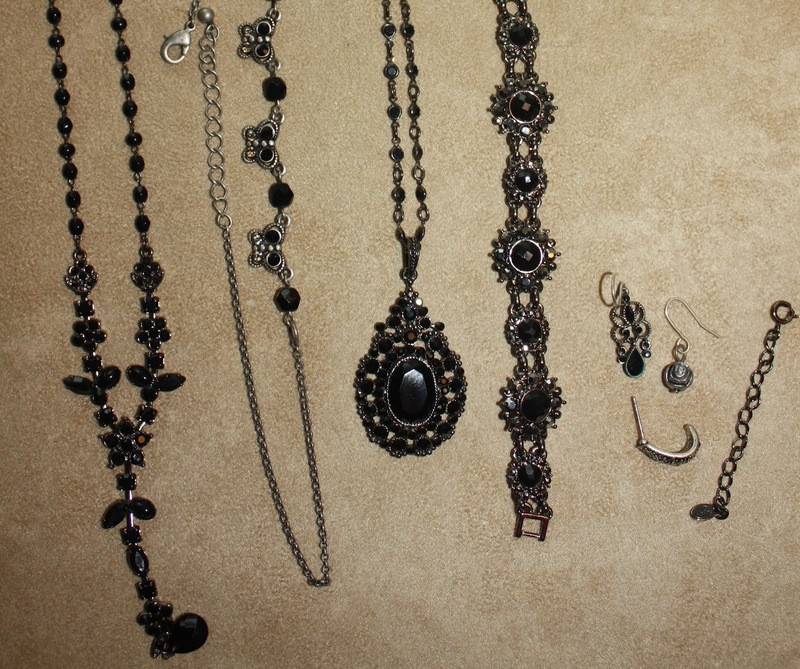 What do Thrifting and Jewelry Repair Have in Common? I was asked to do some jewelry repairs for an old friend who basically sent me a big box of broken stuff and said 'have at it'. This is not my a normal part of my business but I agreed to try. Several of the items were easy and required only a few new findings or restringing. The challenges for me are the one of a kind and more 'commercial' pieces and what I can do to bring them back to life for her. 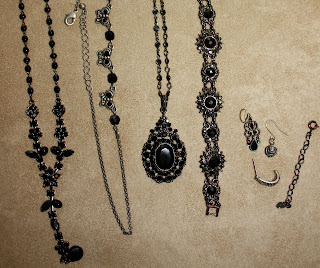 Several of the pieces are jet/onyx or black faceted glass pieces, reminiscent of what I might describe as faux 'Victorian Mourning Jewelry'. The necklaces themselves needed simple repairs, but she wanted me to make coordinating earrings for each set and that is the puzzle. I scoured all my usual online sources, but nothing really fit the bill. I decided to take a field trip to my favorite Thrift Stores and see if I might find anything that could be made to work. What I came away with were 3 sets. 8 glass 8mm jet faceted glass beads ($1) from the first place . 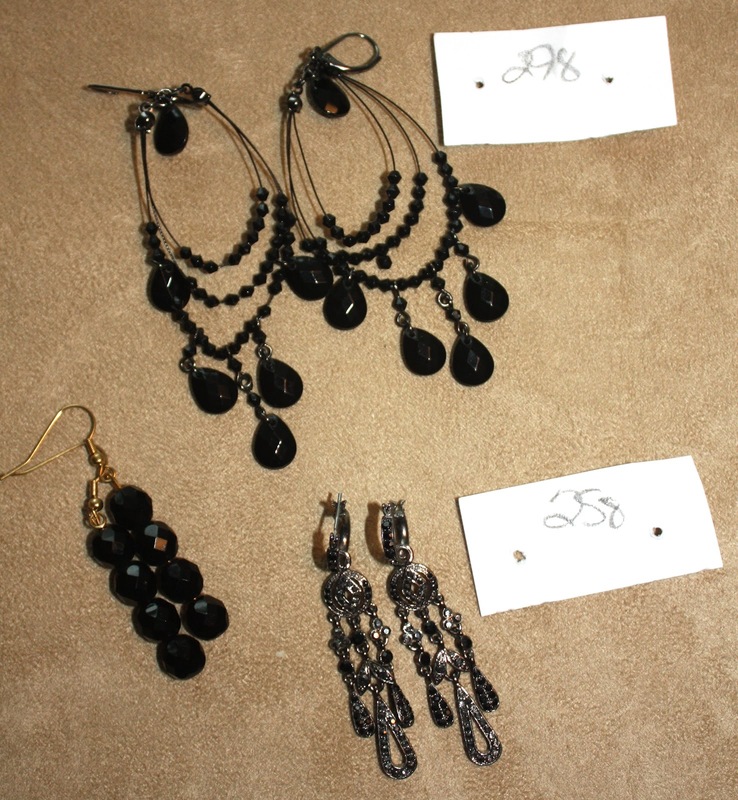 From my most fav~ CHKD shop ~Two piece Marcasite type chandelier earrings (a couple of tiny stones missing) ($2.58) and a pair of earrings with black faceted tear drops, and tiny bi-cones with gun metal findings. ($2.98). Did I mention it was 'military day' so I got an additional 20% off the 2 more expensive pairs? Now to break them down and revamp my treasures. Tune in soon for the big reveal. I love being thrifty, revamping and repairing. Why throw good things away when they just need some tender care? I really enjoyed your post, you got some great goodies! I LOVE scouring thrift stores for recyclables! Also, places like "Claire" in the mall have items that, when deconstructed, are worth the buy. I also like Spencers for this too. Some of the pendants and charms can't be found elsewhere. Beautiful page and wonderful necklace!! Ohh you did really good! I never get that lucky when I go out - must be in the wrong stores! I haven't revamped anything but I have made pieces to go with some earrings and things that I purchased from another artist. I try to buy something from one or more of our fellow artists every couple weeks. It is kind of putting a dent in our budget so thats why I ATTEMPT to make my own coordinating pieces if I can. The pieces I make compliment the artist's piece of jewelry, never copying or out shining their piece. Please be sure to show off your results! I am really interested in what you come up with.